Meet spunky sleuth Shelby and her sports-loving sidekick Watson as they take on a dog-napper in this fresh twist on Sherlock Holmes. Shelby Holmes is not your average sixth grader. She’s nine years old, barely four feet tall, and the best detective her Harlem neighborhood has ever seen—always using logic and a bit of pluck (which yes, some might call “bossiness”) to solve the toughest crimes. When eleven-year-old John Watson moves downstairs, Shelby finds something that’s eluded her up till now: a friend. Easy-going John isn’t sure of what to make of Shelby, but he soon finds himself her most-trusted (read: only) partner in a dog-napping case that'll take both their talents to crack. Sherlock Holmes gets a fun, sweet twist with two irresistible young heroes and black & white illustrations throughout in this middle grade debut from internationally bestselling YA author Elizabeth Eulberg. ELIZABETH EULBERG is not a detective (or so she claims). She is, however, the internationally bestselling author of The Lonely Hearts Club, Prom & Prejudice, Take a Bow, Revenge of the Girl with the Great Personality, Better Off Friends, and We Can Work it Out. Elizabeth lives outside Manhattan, where she spends her free time stalking English bulldogs in her neighborhood and filling her brain attic with random pop-culture facts. 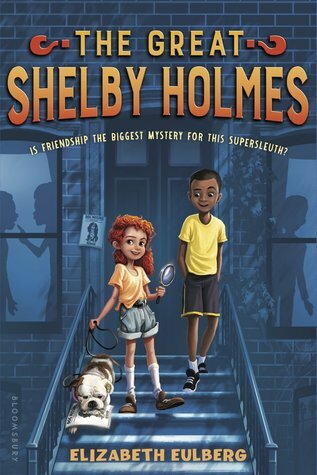 The Great Shelby Holmes is her first middle-grade novel. This story hooked me from the first page from both the tone and also the character of Watson. I was hooked by the first chapter and wanted to read even more after Holmes and Watson meet. The story is set in NYC and that is where I lived so it was very easy for me to connect to this story. I could see she also spent a lot of time crafting the world and hope she writes more in this series because it is a very well-developed world. This book is very fast paced especially if you have kids that get board fast this book is a such a fast read and the story did not suffer from how fast pace the novel was either. I really enjoyed both main characters of the story so much. I loved how the characters were built and their interactions really stole my heart. I hope we get to see these characters again because they were so much fun to read about. The mystery and the relationship between Holmes and Watson really kept me wanting to read especially the mystery. I did not know the ending until the end and that was very hard to do when I read. The characters interaction also brought another level of conflict to the story as well. The dialogue in this book is very unique especially Shelby but that is because of the character she is and that is stated by everybody how not normal it is. The dialogue of the other characters is so modern day that it makes holmes dialogue even more unique. Holmes and Watson for the middle grade world. This book is for middle grade readers and does have a very diverse cast.